Idol Theory: Ramiele Malubay -How Did She Make Top 9? Ramiele Malubay -How Did She Make Top 9? Many are wondering how come Ramiele was not sent packing last week (Top 10). Surely she was the weakest performing contestant of the round. Yet not only was she through to the next week, but she didn't even appear in the bottom 3? What gives? Some theorize that because of her cuteness, sexiness, nice breasts etc. she has a strong enough fan base to make it possible to survive even after clearly deserving the elimination card. Could it be that her racy pics have worked in her favor? Or maybe it is that being of Asian descent has helped her garner the support of that racial group, making a very strong fan base. Or is it that people have seen some potential in her, and are keeping her in hoping to see her shine? Well the truth is, she has shown potential in some of the earlier rounds. She can definitely sing. However, let's not forget David Hernandez. He clearly has awesome potential, but with one bad week, he was dumped. So in all likelihood it must be more than this. Folks, it is time to wise up! Undoubtedly Ramiele did get the lowest votes. A certain source revealed this, but even without special revelation, surely we all knew this intuitively. Just check the polls around to verify this. They were pretty much in agreement. As I explained in the results show recap, instead of the one with the lowest overall votes being eliminated, it appears that the male with the lowest votes was chosen to leave. So why would the producers pull this stunt, you ask? Well first of all, don't think this is the first they have done it. As my theories and recaps here would attest, I have been saying this from last year during Season 6. So why sacrifice Chickeze instead of letting go of the real bottom vote-getter? It is basically part of the strategy of the producers to have an entertaining show and to see that Syesha grows in popularity. As it pertains to having an entertaining show, the producers know that key to that is keeping it unpredictable. When the various polls around unanimously say that Ramiele was the lowest, then it robs the show of the surprise element if they allowed her to go. Regarding the building of Syesha's popularity, keep in mind that Syesha and Chickeze were the only remaining black contestants. This means there was some division of support from the black community. With Chickeze gone, Syesha now stands a chance of getting more support from this community. Also, know that Syesha most certainly was not in the bottom 3, much less the bottom 2! But by placing her in this group, the public is led to believe she is in danger, and so will probably vote harder for her. But why help to promote Syesha? The simple fact is, Syesha has been improving since she hit the top 12, and she shows great potential. The further a contestant goes, the greater the marketability he/she has, generally speaking. 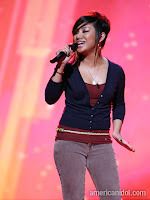 However, Syesha was downplayed by the judges in earlier rounds, and so she didn't readily gain the love of the public. Now that she is highlighting her talent, the producers want to boost her chances of going further. Why didn't Ramiele even appear in the bottom 3 even though she got the lowest votes? Most probably, the producers are trying to maintain the surprise value. Since people think she has such a strong fan base, they might become laxed in voting for her, and try to save other contestants instead. But the truth is, her fan base has already reached the limit. So if Ramiele were to get bumped off in the next round, it creates a shock sensation which of course is good for tv. This probably means that Ramiele will get the boot this week, unless she does extraordinary well. She and Kristy will be competing for the elimination spot. wah wah wah. stupid theory. Dumbest thing I've ever read. Ramiele has had only one half-decent performance -- Top-24 week. Last week she was horrendous. I thought it was the worst performance of the season. Please, please let her go home this week. It would be a travesty for her to stay another week. even worse than kristy's crappy beatles week? i think not. bla bla bla. another crazy theory! there was no *shock* that ramiele left this week, no matter how much the producer want to create it by never putting her at the B3. she gave a bad performance singing an unknown song and she's gone. "Alone" was bad, but not that bad and the song was awesome. PLUS she had the cold excuse. people rooted for her then and she was safe. this is a total crap! ramiele's just famous! why would the producers want to tamper with the votes, with all the legal consequences they need to face with public deception, if caught! Top 12 Results Show : Re-Crap!